Ask The Bellwether: How do you dye silk? Silk caps, hankies, yarn, sliver, fabric ... any form of silk can be dyed. Silk takes the same dyes as wools; but it takes a bit longer to get it wet through, so soak it for at least an hour (even overnight) prior to dyeing. It also can benefit from post-mordanting, a soak in a water/vinegar solution (if you are using acid dyes) for an hour after dyeing. See How do you use Cushing's Dyes? for more details on the topic of dye in general with acid dyes. Besides acid dyes like Cushings and Jacquard, there are Wilton's cake icing dyes, koolaid, and easter egg dyes -- all acid dyes as well. For more information on dyes than you may ever want, I'd recommend browsing the Dharma Trading website. I'm getting ready to teach a dye class again, so I've stocked up on Reduran from Dharma. Tussah silk has a natural golden tone that will take up most dyes into more jewel-like tones than its cousin stark white Bombyx or cultivated silk. 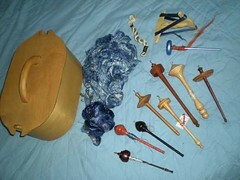 The silk in the picture with my silk spindles (click the picture for more information on them) is Bombyx silk. I didn't get the solid tone I was aiming for because I hadn't learned at that point about pre-soaking the silk. How is spinning silk different from wool? How can I spin fine yarn? There are also some great silk-spinning videos and a really fun one on stretching silk caps on YouTube in the YouTube handspinning group! Do you have some tips on dyeing silk to share? comment on this blog entry, contact me, or email. Thanks! Do you have silk dyeing tips to share? I let my silk soak for at least 24 hours, often longer and I'm getting an even dye. I'm not sure where I read 24 hours minimum (maybe it was in Deb Menz's Color in Spinning). Amelia, congratulations on one of the most informative blogs I've read!